Pfc. Sean Robertson and Pvt. 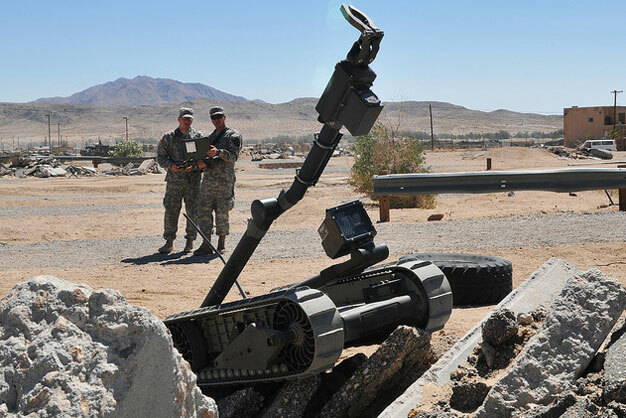 Geno Romero—both with 4th Stryker Brigade Combat Team, 2nd Infantry Division—practice climbing rubble with an iRobot Packbot 510 during a robotics class at Fort Irwin, Calif., on June 4. Robertson, a combat engineer with 38th Engineer Company, and Romero, a cavalry scout from A Troop, 2nd Squadron, 1st Cavalry Regiment, participated in the robotics course during Reception, Staging, Onward Movement, and Integration (RSOI) at the National Training Center. US Army photo by Sgt. Kimberly Hackbarth, 4th SBCT, 2nd Inf. Div. Public Affairs Office.